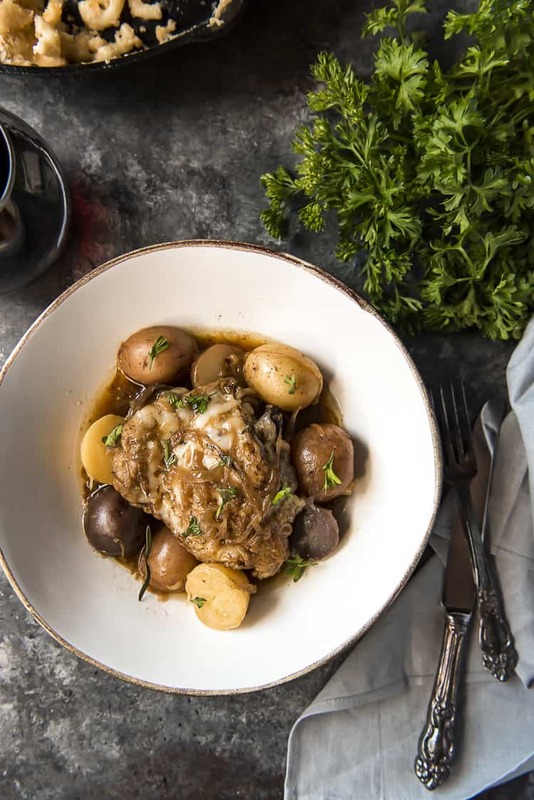 Hearty, comforting, and perfect for cooler weather, this Slow Cooker French Onion Chicken is a family favorite! 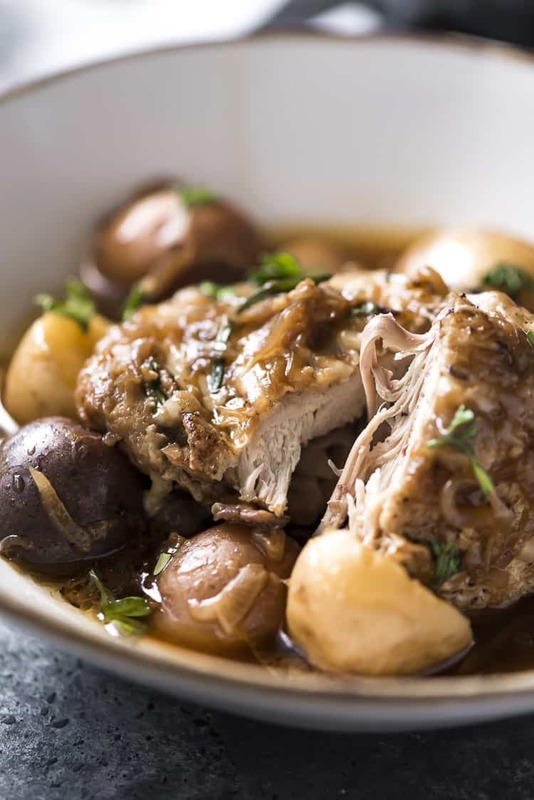 Complete with tender baby potatoes, slow caramelized onions, and shredded Gruyere cheese, this is a one-pot chicken thigh meal you’re going to love having on rotation. So my question of the day today is: are you a soup lover, hater, or tolerator? One type of soup I’ve never been a freak over is French onion. Don’t get me wrong – I love caramelized onions more than some of my family members. I’d honestly rather just eat them with a fork than in a thin broth. Adding them to an easy one-pot chicken dinner, though, was almost a stroke of genius. One that might make me reconsider this whole “soup mood” thing. JUST TAKE ME TO THE FRENCH ONION CHICKEN ALREADY! If you’d rather skip my (pretty darn helpful) tips and tricks, essential cooking info, and similar recipe ideas – and get straight to this deliciously easy slow cooker chicken thighs recipe, just scroll right on down to the bottom of the page where you can find the printable recipe card! After many years of preferring white meat chicken, I’ve finally turned to the dark side. Chicken thighs became my obsession over the summer, and it looks like it’s one that’s gonna keep on keepin’ on into the colder months. 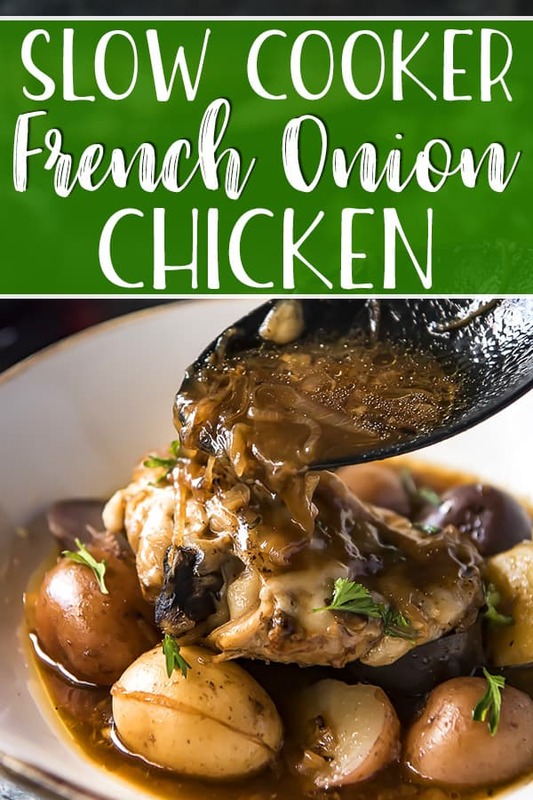 It surely will be after a few bites of this French Onion Chicken. 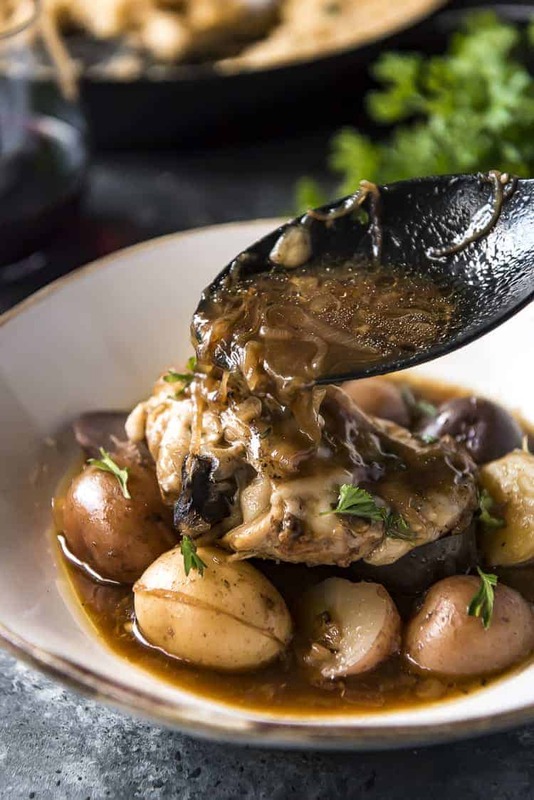 Juicy seared chicken thighs, swimming in a pool of French onion-style gravy. Tender baby potatoes, infused with the same comforting flavors. Melty Gruyere cheese and fresh herbs. If this doesn’t become one of your favorite fall dinners, we clearly have opposite tastebuds. Do You Have To Brown Chicken Before Slow Cooking? You DO NOT have to brown chicken thighs before slow cooking them, but they will taste SO much better if you do! Searing meat before slow cooking, especially poultry with skin, helps it develop delicious, deep flavor it wouldn’t otherwise. Browning/searing is a quick process, and shouldn’t take more than 4-5 minutes for both sides of a chicken thigh. 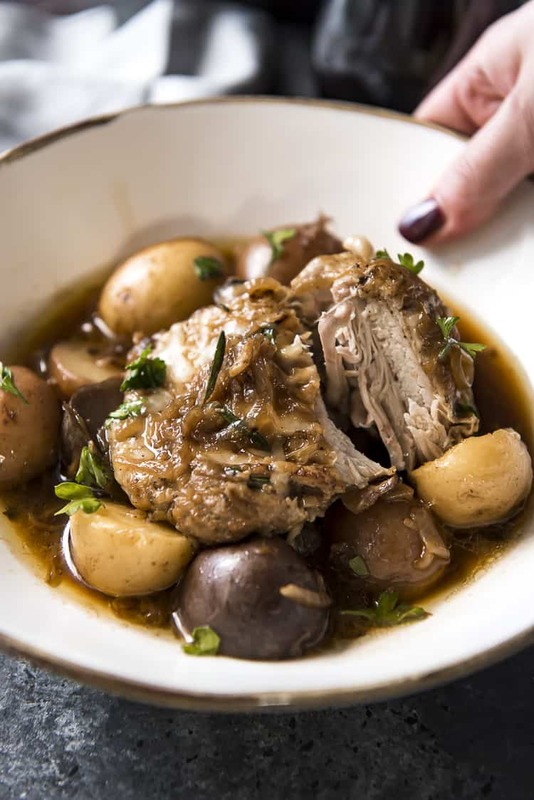 Dark meat chicken tends to stay moist longer than white meat, but you still don’t want to overcook it before it even goes into the slow cooker. Can You Put Raw Chicken In A Slow Cooker With Vegetables? Yes, you can cook raw chicken with vegetables in a slow cooker. Everything cooks together to a temperature that kills any bacteria that may have lived on the chicken (165 degrees F). However – this is another good reason to brown your meat before slow cooking. If you have concerns about this subject, searing the chicken on high heat prior to adding it to the slow cooker will kill any bacteria living on the chicken skin. How Long Does It Take To Cook Chicken Thighs In A Slow Cooker? On low heat, it will take 5-6 hours to cook chicken thighs. On high heat, 3-4 hours will do the trick. Make sure the internal temperature inside the thickest part of the chicken is 165 degrees F before eating it. First, pre-caramelize your onions in butter over medium heat. This initial browning will add all kinds of delicious flavors to the final dish. Then, transfer the onions to your slow cooker and sear the seasoned chicken thighs over high heat, 4-5 minutes, until lightly browned on both sides. Next, add baby potatoes, chicken broth, garlic, and herbs to the slow cooker. Stir it all together with the onions, then lay the chicken thighs on top of everything. Close the lid and slow cook for 4 (high) to 6 (low) hours until chicken is cooked through to temperature. Finally, lay slices or shreds of Gruyere cheese on top of the chicken. Close the lid and allow it to melt for 4-5 minutes more before serving with potatoes and onion broth. 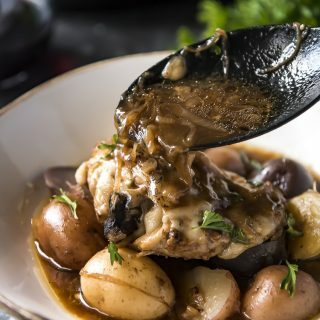 Hearty, comforting, and perfect for cooler weather, this Slow Cooker French Onion Chicken is a family favorite! 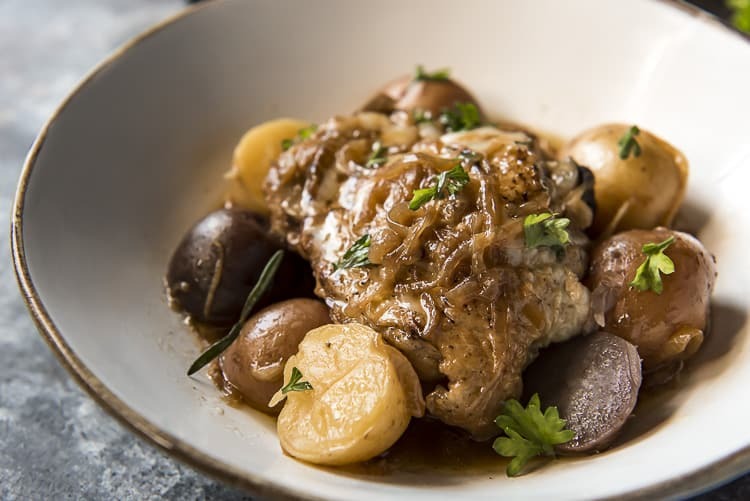 Complete with tender baby potatoes, slow caramelized onions, and shredded Gruyere cheese, this is a one-pot chicken thigh meal you're going to love having on rotation. Melt 2 tablespoons of butter in a large skillet set over medium heat. Saute onions until golden, about 15 minutes. Transfer to slow cooker. Wipe out skillet. Pat chicken thighs dry with paper towels, then season to taste with salt and pepper. Melt remaining butter in skillet over high heat. When bubbling, add chicken thighs, skin-side down, and sear for 2-3 minutes, or until skin is browned and releases from the pan easily. Flip chicken and sear other side another 2 minutes, then remove from heat. Add broth, garlic, herbs, and 1/2 teaspoon each salt and pepper to the slow cooker with the onions. Stir to combine. Place chicken thighs, skin-side up, on top of the potatoes. Spoon some of the onion-broth over the chicken. Seal the lid and slow cook on low for about 6 hours, or high for 4 hours. When cook time is up, remove the cooker lid. Place the Gruyere slices on top of the chicken, then replace the lid and allow the cheese to melt, 4-5 minutes. Serve with potatoes and onion broth. Garnish with parsley if desired. 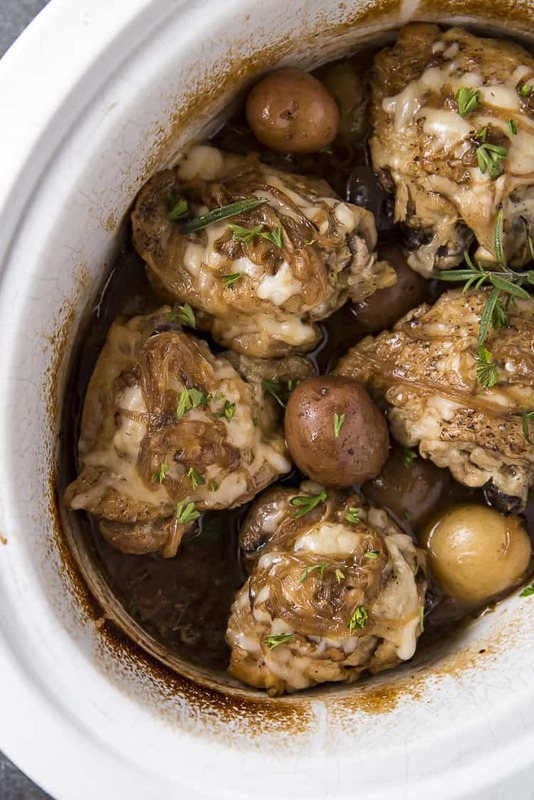 PIN THIS FRENCH ONION SLOW COOKER CHICKEN FOR LATER!